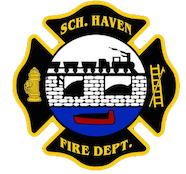 April 15, 2009- At 13:08 all 3 Schuylkill Haven stations were dispatched to 1628 Route 61, (Tiger’s Den) for a vehicle leaking fluids. While units were en route, they were advised of a gasoline truck with a possible rupture to one of it’s saddle tanks. Duty Chief 723 (Donatti) arrived on scene and confirmed the leak coming from the tank and placed himself in command. On scene personnel quickly plugged the hole in the tank and began containing the diesel fuel that was already leaked out. Apparatus on scene used floor dry, booms, and pads to contain the leak, as well as a PENNDOT sand truck to contain the spill which stretched from Schuylkill Haven to Cressona. The Schuylkill Haven Fire Department was busy for the better part of 2 hours.